Mormon Mommy Writers and Friends: RISE AND SHINE!! Rise and Shine... Give God the glory, Glory! RISE AND SHINE! GIVE GOD THE GLORY, GLORY! I remember singing this at Girls camp many years ago, and for some reason this morning it came to my mind, and I found myself humming to myself, bouncing around to get ready for the day. Now keep in mind that I just flew back in from Oceanside, CA yesterday, and was bracing myself for a traumatic adjustment of the body back to VA time. Not only did I feel awake, but I was in such a good mood! I woke my kids by tickling and kissing them instead of the typical "WAKE UP KIDDOS!" accompanied by a spray of water... just kidding on the water. He asks us as we go to sleep at night to lie unto him, that he'll watch over us, and when we wake up, to let thy heart be full of thanks unto GOD. And THEN comes the promise!! "...if ye do these things, ye shall be lifted up at the last day."!! First is the commandment, then the appropriate blessing! 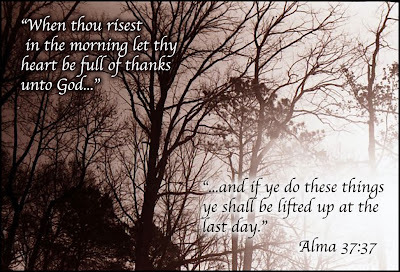 I think that one of the reasons it comes with such an incredible blessing, is because by going to bed at night and rising with the LORD, we cannot help but take it with us through the day... and it has a continuing effect of being lifted up at the last day. So remember, as you prepare for each day, whether it's getting your kids up and going, preparing for work, or buckling down on that writing that you know you have been gifted to share, do it in the LORD.... and I promise that you will feel the blessing of that promise! Rise and shine, give GOD the Glory... children of the LORD! What a beautiful, cheerful post! Thanks for this one Syra! What a perfect post to wake up to! hostgator discount code choice for every intelligent hosting buyer.